“What’s his name again? 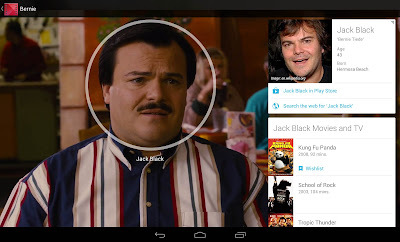 Wasn’t he the guy in that movie with the battle of the bands?” Now, while you're watching a movie on Google Play, you can find out that it’s Jack Black (of course! ), who was born in Hermosa Beach and is 43 years old. And with one click you can search the web and learn the fun fact that his parents are both rocket scientists. We’ve added info cards to the Google Play Movies & TV app so you can easily learn more about the actors, related films and even what song is playing in many of your favorite movies. When you’re watching a film on your tablet, simply press pause and cards will pop up with information about actors on screen. You can tap on an actor’s face to learn more about him, like his age, place of birth, his character in the movie, and his recent work, or scroll through the info cards to learn more about the movie or soundtrack. When you resume the movie, the cards will disappear. 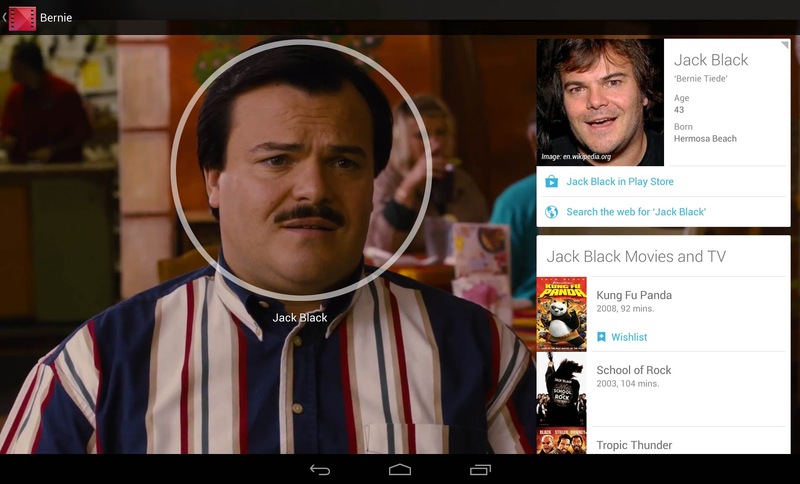 This new feature is offered for hundreds of movies in Google Play and we’re adding more every day. If you’re in the U.S. and have a tablet running Android 4.0 (Ice Cream Sandwich) and higher, download the latest version of the Google Play Movies & TV app to check it out. We hope to bring info cards to more movies in more countries and devices soon. The information is really helpfull I have been lookin all over it in internet finally got the right place i just want a lil favour plz do share ma android blog From your website thanksAll About Android The Most active and Addictive Blog on Internet. We offer daily All New Free. Downloads on Application,ROMs,3D-HD Games,tips and tricks,news and reviews Thanks alot Admin ! !